On the day of commemoration of the Holy Foremost Apostles Peter and Paul (29 of June/ 12 of July) at the Livadia Place in Crimea the solemn ceremony of the unveiling of a portrait of the Holy Royal Martyrs of Russia took place. This portrait augments a current collection, which has been gathered through the efforts of the Chief Procurator of Crimea ­­– Natalia Poklonskaya. Upon the unveiling of the portrait, on behalf of His Eminence Metropolitan Hilarion First Hierarch of the Russian Orthodox Church Outside of Russia His Grace Theodosy Bishop of Seattle expressed heartfelt appreciation for the ceremony. And, with the blessing of His Eminence Kyrill Archbishop of San Francisco and Western America, Natalia Poklonskaya was awarded the Order of Saint John of Shanghai and San Francisco, II Degree, for merits performed benefiting the Homeland and the Church. She was also presented with an icon of that Saint. 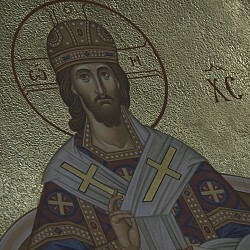 After the solemn ceremony a Thanksgiving Moleben was performed in the Church of the Holy Cross at the Livadia Palace. Today, on the Feast of the Holy Apostles Peter and Paul, I have the honor of representing and bequeathing this portrait of the Great Emperor of All-Russia Nicholai Alexandrovich and his August Family as a gift to his residence (to the Livadia Royal Palace Museum Park). In just a few days, from the night of the 16th to the 17th of July, in Orthodox churches Divine Services will be conducted in honor of the martyrdom of the Holy Royal Martyrs of Russia. In March of 1917 the entire Royal Family was under house arrest, and from confinement in Tobolsk they were sent to be held in Yekaterinburg. Here on the night of the 16th to the 17th of July, 1918, in the basement of the Ipatiev House all them were cruelly murdered in such a beastly manner that we should share the words of Elder Nicholai Guryanov: "The Angels wept, for what was done to them. Children were tortured in the presence of the numbed Holy Martyrs... the names of those who did this are not revealed… they did not and do not love Russia. They possess a satanic malice." When the watch arrested the Saviour, Apostle Peter strives to save Him using a sword: "Then said Jesus unto Peter, Put up thy sword into the sheath: the cup which my Father hath given me, shall I not drink it?" (John 18:11). Following in the Saviour’s steps, the Emperor drank his cup to the bottom. Redeeming is the Act of our Saviour, Who voluntarily gave Himself up for crucifixion on the Cross. “Christ-emulating” is the act of His anointed one. Here are the words of Nicholai II, that were spoken by him in 1915 upon accepting Supreme Command of the Russian front: "Perhaps a redeeming sacrifice is needed to save Russia. I will be that sacrifice." Speaking in the words of Patriarch Kiril: "the truth about the sacrificial act of Emperor Nicholai II has grown up and through cement slab that was placed upon his name." One can observe an amazing phenomenon. The writhing of a vampire before the dawn’s rays, the demonic fear of light is a reaction to the holiness of the Emperor. It is paradoxical, but the fiends of the 20th Century (Lenin, Trotsky, Hitler, Mao Zedong) who poured a sea of human blood never evoked such repulsion, as did the good and merciful Emperor murdered with his family. It was he who cardinally improved the good estate of his people and was numbered with the choir of the Saints at the end of the 20th Century. This is what Nicholai Guryanov has to say: "It made them sick to even hear the holy name of the Tsar. He has God’s great power to oppose them." History has not named a civil leader who was so maligned as the last Russian Emperor Nicholai Alexandrovich. During the course of long decades people in relation to their murdered Tsar heard only mockery and hatred. Party ideologues, publicists, writers, artists, scene writers and directors all tried to out do one another in an effort to stain the holy name of the Emperor. If the Emperor acted with toughness and fought the against the revolution, the liberals labeled him "bloody." If he allowed the "Duma" (Parliament) and permitted freedom, the conservatives called him week-willed. The main thing for the radicals of all shades and colors, the thinkers and publicists, civil servants is to be decisively silent about just who Emperor Nicholai Alexandrovich was. That would be the railroads, the lowest taxes in the world, the affordable education for all, the most democratic labor policies, the canonization of the Saints, the building of churches and monasteries, the preservation of Russia’s identity. Nicholai II is the freedom and honor of our motherland! The unheard of pace to which Nicholai II gave his reforms, to the modernization of the Russian economy and industry, to education, to health, to agriculture, was not only comparable to the reforms of Peter, but in many areas surpassed them. The Emperor’s uncompleted reformation of the country has been completely distorted and his successes have been baselessly assigned to the Revolutionaries. Archpriest Dimitri Smirnov has said: "Emperor Nicholai II and his family through their pious life were a silent reproach to the aristocracy who did not live accordingly." 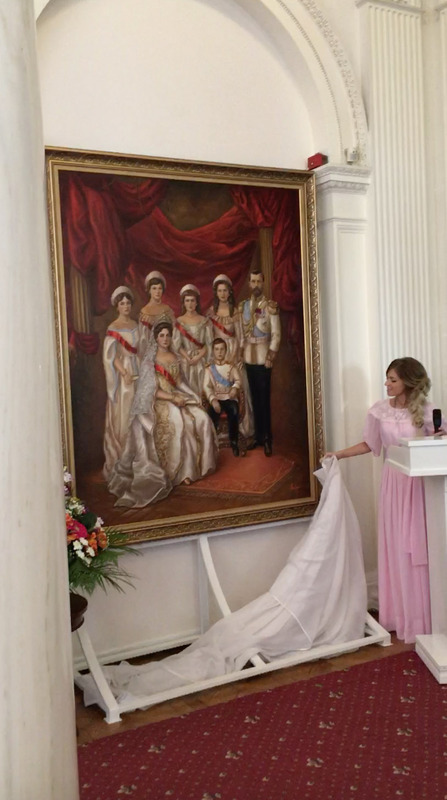 The Tsar desired to defend the identity of Russia, even while modernizing it. But society at large wanted "to make" Russia into another France or Switzerland. "My father requests all those who have remained devoted to him and those upon whom they can exert influence that they would not avenge him as he has forgiven everyone and prays for all so that they would not avenge him and so that they would recall that the evil that is in the world now will only increase and that we cannot overcome evil with evil, but only with love. " Holy Emperor Nicholai Alexandrovich did not require, obviously, any defense or intercession, because God Himself glorified him. Saint John of Shanghai said: "Emperor Nicholai Alexandrovich incarnated in himself the attributes of tsars who were known, loved and respected by the Russian people." Further he said: "The Emperor began and ended his day with prayer. He was a model of chastity and was the head of an exemplary Orthodox family." What struck an impression on those who had seen Nicholai II only but once was his eyes. The Emperor himself attached great significance to the glance of his interlocutor. He said: "If even one of those people (having in mind Guchkov and Lvov), who do not look in the eye, I at any time assign as a minister, it will mean I have lost my mind." "God grant," wrote priest Afanassy Belyaev, "that all children would be morally preeminent like the children of the Tsar. They have such guilelessness, humility, submission to their parents’ will, unconditional devotion to the will of God, purity of thought and perfect ignorance of earthly filth…"
The Emperor said: "The higher a man’s position, the more he should help others, and never remind others of his station; my children should be the same." The Livadia Palace became the favorite place of the Royal Family. The walls here are soaked with the history of happy days for the Holy Royal Family. The new palace was a present to Empress Alexandra Feodorovna from Nicholai II. It was no accident that the foundation of this New Great Palace was placed on the Names Day of Alexandra Feodorovna, the 23 of April, 1910. Witnessing to this event is a silver plate in the very foundation of the palace with a corresponding text. The most solemn and elegant room in the palace was the grand dining hall, the entry through which was the grand vestibule. Respected friends, here everything is literally permeated with the memory of the Holy Royal Family. And their portrait by all rights occupies an honored place. Our wonderful and unusually talented painter, the Minister of Culture A.V. Novoselskaya, the Director of the Livadia Palace L.V. Dekushev, and of course my faithful friends and helpers – the employees of the Procuratory of the Republic of Crimea. And before finishing this greeting I wish to read a poem written by the very hand of Grandduchess Olga Nicholaevna (during the investigation of the brutal murder of the Royal Family it was discovered in a book belonging to Granduchess Olga Nicholaevna). To endure shame and humiliation! Master of the world, O God of the universe! In the unbearable hour of death. To pray meekly for our enemies!